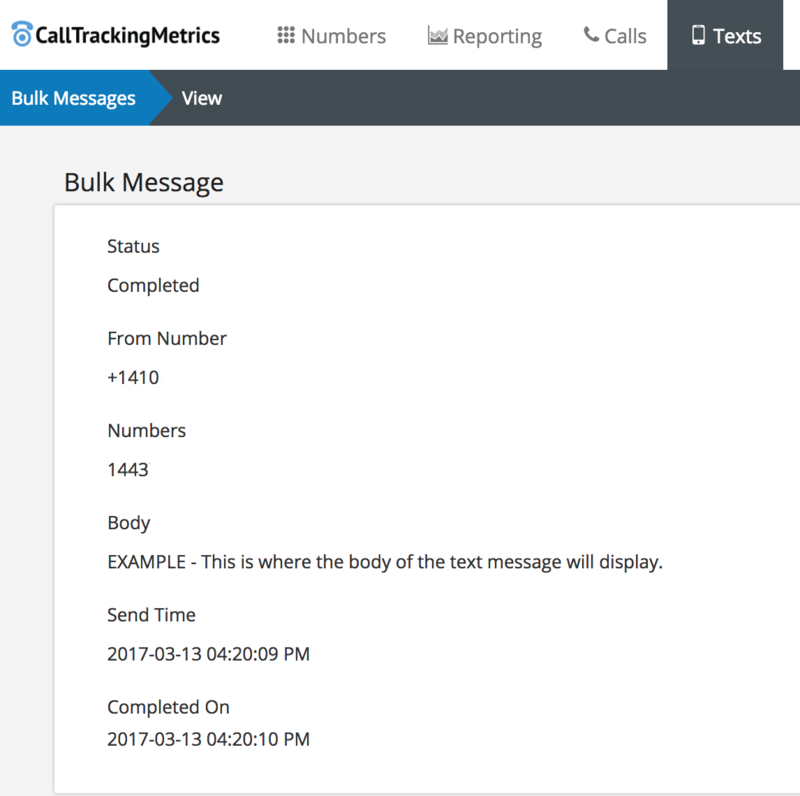 You can use your text-enabled tracking numbers to send bulk text messages through the CTM system. This is an easy way to quickly send a text message to a list of your customers. If you need to confirm, or enable, text messaging with your tracking numbers, you can learn more about that here. Once you have at least one text-enabled tracking number in your account, you can create or view your bulk messages by going to Texts → Bulk Message Log. This page will display all past and scheduled bulk messages. If a message is scheduled for a future time, you can click Edit to make changes before it is sent. When you are editing a scheduled message, you can also click Cancel Bulk Message to cancel the scheduled message. If the bulk message has already been sent, you can click View to see details about the message, including the status, tracking number that sent the message, the list of recipients, the body of the message and the send and completion times of the message. To create a new bulk message, click the New Message button. Enter your message into the Body field on this page, then scroll down to the From Numbers section. Use the Search field on the left side and then click on the tracking number(s) that you would like to send the bulk message. The tracking number(s) you select will be displayed on the right side, under From Numbers. The next step is adding your list of recipients to receive the message. You can click Manual Add to manually enter your list. 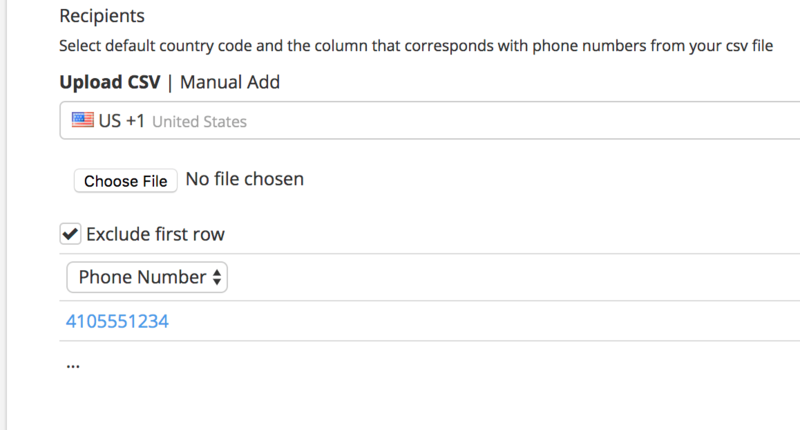 Enter one number per line, including the country code (e.g. +14105551234). You also have the option to upload a CSV file of your recipients. 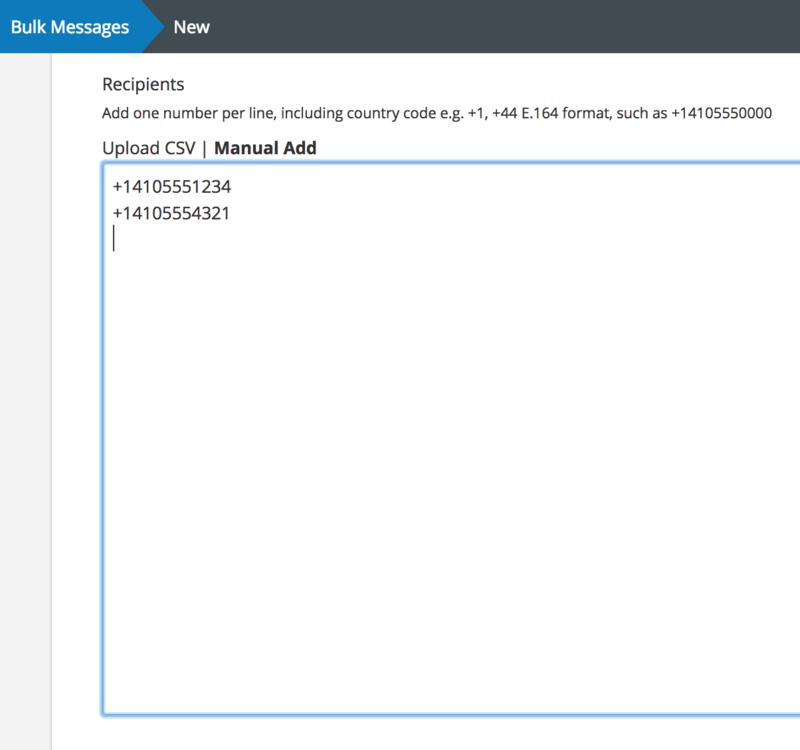 Click on Upload CSV and then select the country code to be used for all of these recipients. Click on Choose File to select and upload your CSV file. Once the file is uploaded, you will see the first entry of your list. This can help you determine if you need to toggle the option to Exclude First Row. Click the Exclude First Row checkbox if needed (e.g. CSV file uses column names or headers). The last step is choosing when to send the bulk message. You can choose to Send Now, and the message will be sent as soon as you click Schedule Bulk Message. 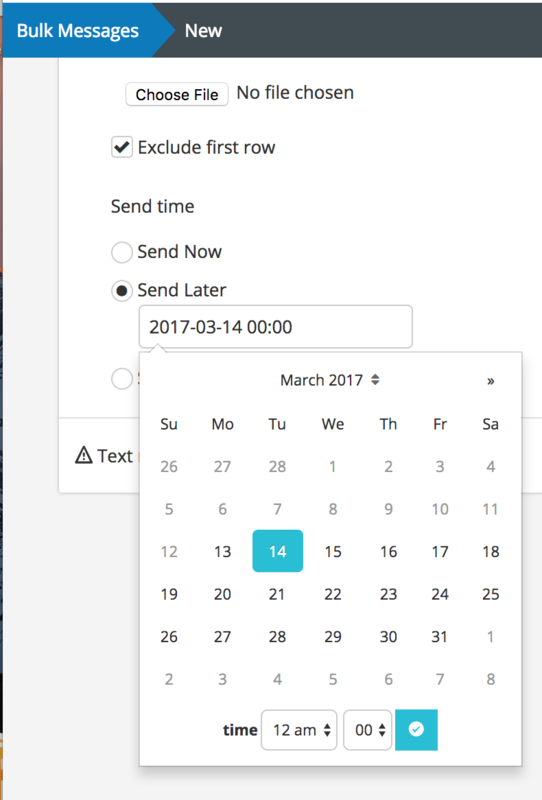 If you choose Send Later, you can select a time and date to send the message by clicking in the field and using the provided calendar. You also have the option to choose Send Recurring if you would like to schedule a recurring message. 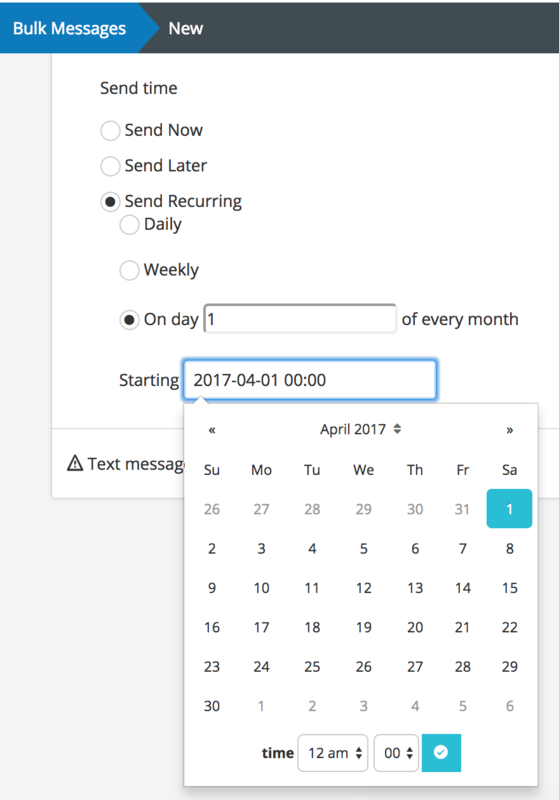 Once you select this option, you can choose to repeat daily, weekly or on a selected day of every month, and you can also choose when to send the first message by clicking in the Starting field and using the provided calendar.